2. 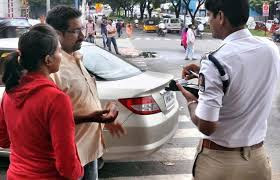 Hefty penalties are being proposed for traffic violations such as juvenile driving, drunken driving, driving without licence, not wearing helmets and seatbelts, dangerous driving, over-speeding, overloading, etc. 3. Guardian or owner shall be deemed to be guilty in cases of offences by the Juveniles. They will have to pay penalty of Rs. 25,000 apart from undergoing 3 years imprisonment. The juvenile will be tried under Juvenile Justice Act. Registration of his/her motor vehicle will be cancelled. 4. It would enable online learning licenses, increase validity period for driving licenses and do away with the requirement of educational qualifications for transport license. 5. It proposes to have automated fitness testing for the transport vehicles with effect from 1 October 2018. 6. To improve registration process for new vehicles, registration at the end of the dealer is being enabled and restrictions have been imposed on temporary registration. 7. It proposes to improve the transport scenario in the country by permitting the States to grant exemptions in stage carriages and contract permits for promoting rural transport, public transport, and last mile connectivity and for passenger convenience and road safety. 8. It proposes the State Government to regulate the activities in a public places for pedestrians and means of transport. This will increase corruption and not road safely.